For Science Sunday this week, we decided to go on a turkey hunt. The children were slightly disappointed to discover I meant for it to be a turkey spotting expedition, and we weren't actually going to shoot a wild turkey. But, their enthusiasm returned when we spotted a small flock, crossing the road, on the outskirts of town. 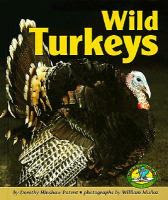 According to the Montana Field Guide, wild turkeys are not native to our state, but were introduced. They seem to be thriving now though. And, they gave us a very fine display of camouflage in action. Can you spot the turkey in the picture below? ...and it will hold us over nicely, until Dorothy Henshaw Patent's, fact filled, Wild Turkeys, arrives in from a partner library. From what I've seen of this Rookie Reader, on Amazon's instant view, I don't think we'll be disappointed. We also found quite a few interesting, and useful facts from Gary Clancy's Wild Turkey, which is not for children, but for hunters. On page 8 (you can view it on Google Books, here), there is an excellent, labeled, photograph of the beard, dewlap, snood, and caruncles of a turkey. 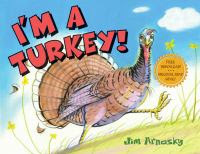 An adult male is called a Tom, or a Gobbler (females don't gobble). An adult female is called a Hen. A juvenile male is called a Jake. A juvenile female is called a Jenny. A baby turkey is a Poult. Turkeys roost in trees at night. They can fly, but not very far. They run about 12 mph, but can put on a burst of speed up to 35 mph (these numbers vary widely, depending on what you are reading). Females lay 10-18 eggs at a time, which take 28 days to hatch. For more fun with science, check out this week's Science Sunday link-up, at Adventure's in Mommydom. How cool to see wild turkeys! 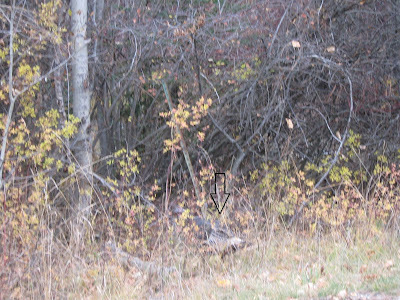 We see phesants once in awhile, but not enough to go on a "hunt" but we never see turkeys. It was fun to see yours. Phyllis - One of the things I love about this area, is you can always pretty well count on finding the animals your looking for. Moose have been the trickiest - but we generally see at least one each summer - and we haven't deliberately gone looking for bears, wolves, or mountain lions - so I'm not sure about them - but enough people around seem to spot them, that I imagine we could too, if we had a desire to see them. Incredible. That must be such a neat thing to get to see. Neat-I've never seen a wild turkey! Great facts! Hey those look like the turkeys that disappeared from our farm when we lived in Elk WA! I think it is hilarious to hear a young male trying to learn how to gobble. We love looking for turkeys! Once we spotted a big bunch of them, so I stopped the car to get a better look. I rolled down my window and "gobbled" at them- and they gobble back! We did this for a series of three times, kinda like we were having a conversation. it very much amused the kiddos and I. Then, they must have been offended by what I said, because they slowly strutted away...I just LOVE turkeys! I got to see some wild turkeys when I was camping one time, and it was a lot of fun to see. I hadn't known about the different names of the stages. I remember a jenny is a mule variation also. When we first moved into our home, the turkeys from the nearby woods would come right up to our front window by the bird feeder. It was super cool. Unfortunately, the same group attacked one of our neighbors when he was out trying to get his mail and the city took matters into their own hands. No more turkeys. You should buy your kids some turkey calling devices. My father hunts turkeys and the kids love to play with his box caller. We have a lot of wild turkeys in our neighborhood. We also have coyotes and I was always surprised that the coyotes didn't eat the turkeys until I realized that the turkeys sleep in the trees! I remember visiting a customer (that happened to be a US Army base) in rural Indiana and being ambushed by a huge flock of wild turkeys. It made me respect their size - they are HUGE. How fun that you can see them so easily.